And it is finally here, in our kitchen. 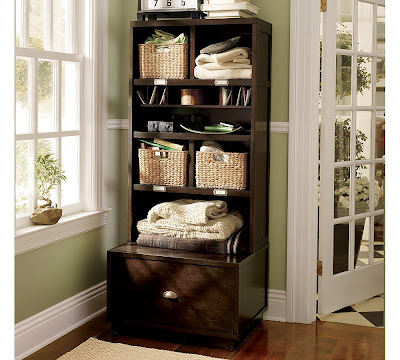 If you don't know what "this" is, it's half of an entryway suite from Pottery Barn. And I am hoping it revolutionizes our kitchen. I was absolutely beside myself when the delivery company called to say it would be delivered last week. They said that not only would they DELIVER it, but they would also ASSEMBLE it. And assemble, they did. When I came through the door from work that evening, the kitchen smelled like that magic scent of Almost Wood. Oh, wood-veneer-over-a-solid-wood-finish, how I love you so. You are so practical and useful for a family with three young boys. Please do not disappoint me. One of the best things about The Arrival of the Furniture was that the family had already started putting it to use. Nathaniel had put a letter from my mom in his basket. And Nick's was empty, but that was OK because I was just pleased he was already charging his PSP. We can work on Basket Filling Skills later. And O to the M to the G. SHOES WERE IN THE DRAWER, NOT IN THE FLOOR. Be still, my beating heart. I am still walking on air. Oh, we really need something like this! LOVE IT! I have started to order that a couple of times, but didn't. Pottery Barn/PBK is AWESOME! Amy, I keep trying to comment on your blog, and I keep not being able to. It's frustrating, but I don't think it's your blog. I think it's my settings, somehow. Anyway, I check it several times a week and enjoy it! Ryan Leigh and WSG, it has been WONDERFUL in just the week that we've had it. I know that the "shine" might wear off after a while, but it is really nice to have the added organizational space in the room we use the most. I was being literal when I called the kitchen our "dumping ground." Thanks, Katherine. As usual, I am behind on blogging. Weird, that you can't leave a comment. I double checked my settings, and they seem fine. Keep trying! I need to start hoarding my pennies too. Our kitchen table is PILED HIGH with backpacks and school bags and mail and shoes and purses and....but then, do you think we would use it?